Cyanotis kewensis, aka teddy bear vine is a ‘cousin’ to tradescantia. They have a similar growth habit to tradescantia although I would say these grow a bit slower. I had seen this plant in my local garden store for a while. It was big and grew in a hanging basket, however – I hope I am allowed by plant lovers to say this – it was UGLY! We can say that no? I know nature is beautiful but when it does not get what it needs, it can be pretty ugly right? Well this plant was ugly, through no fault of its own mind you. I think due to insufficient light or perhaps poor care in general, the plant was spindly and looked quite sad with many dead leaves. Besides me, not having the space to keep it, its appearance did not convince me it was worth buying. On another visit to the garden store, I saw a small cutting of this plant and it looked so adorable. Much more pleasant to the eye than its Mum. It has short ‘chocolatey’ hairs covering the stems and leaves with the green leaves spotting a purple underside. My starter plant has grown quite a bit but not as fast as my T. zebrina cuttings in my opinion. C. kewensis is not very popular from what I can tell and apart from that one local garden store, I haven’t seen it anywhere else. There is also no information on this plant in recently written plant books I own. The only book that I found with information on this plant was the book written by the Reader’s Digest, “Success with House plants” published in 19791! I find fairly old books on plants are well researched and written and contain much more thorough information than currently published plant books – but I digress. Light: Mine is about 3 feet away from a Western window. Its is therefore brightly lit and gets some direct sun1. This allows it to have a compact growth as they look spindly when light is insufficient1. Water: This plant grows actively throughout the year and does not have a resting period, hence it can be watered moderately throughout the year. As with most plants, allow the top half-inch to dry out before watering again1. Apparently, it is beneficial if you occasionally let the soil dry out (for not more than a day or two). Doing this will improve leaf colour1. 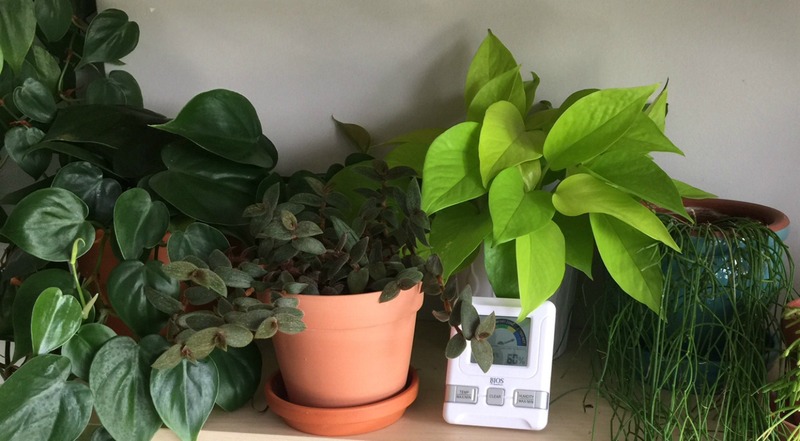 Temperature: Normal indoor temperatures will suffice, however this plant is said to need high humidity. The dreaded word. So far I haven’t done anything special to increase humidity except to place it among other plants. You could place it in a pebble tray of water when its small but when its big and hanging, this might be a problem. You could suspend water underneath the hanging pot with those plastic trays meant to collect water from dripping hanging pots – not sure how effective these methods will be, but it is at least something. I had it in late winter and did not seem to be bothered by the relatively low humidity. For now, the humidity is fairly high (61% today), thanks to the almost daily rain. 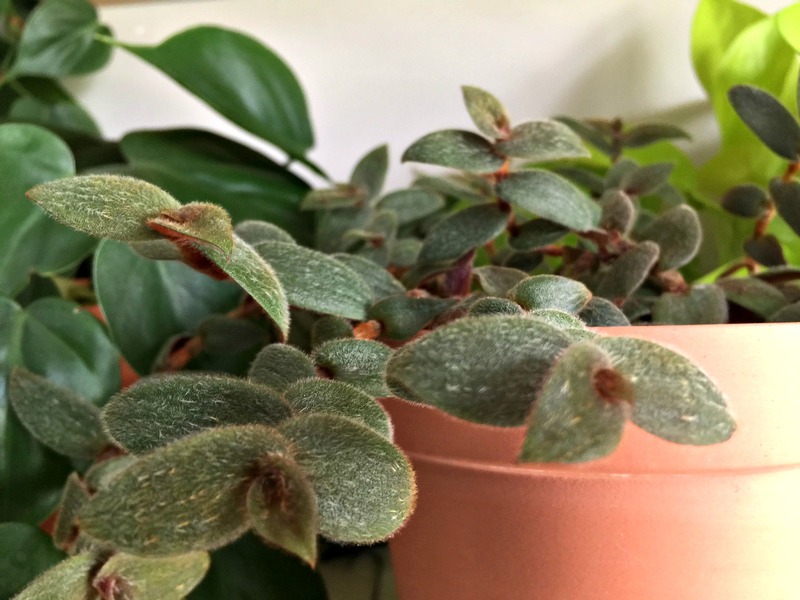 Propagation: Just like Tradescantia, you can make more plants by taking tip cuttings. Take a stem with at least 3 pairs of leaves. Remove the bottom leaves (roots will grow here) and insert it into your medium. As per the Reader’s Digest 1, the plant will live for about 2 – 3 years after which new cuttings should be obtained and the old plant discarded. I imagine it may be unsightly after a couple of years, but thankfully you can start a new plant from the old one. 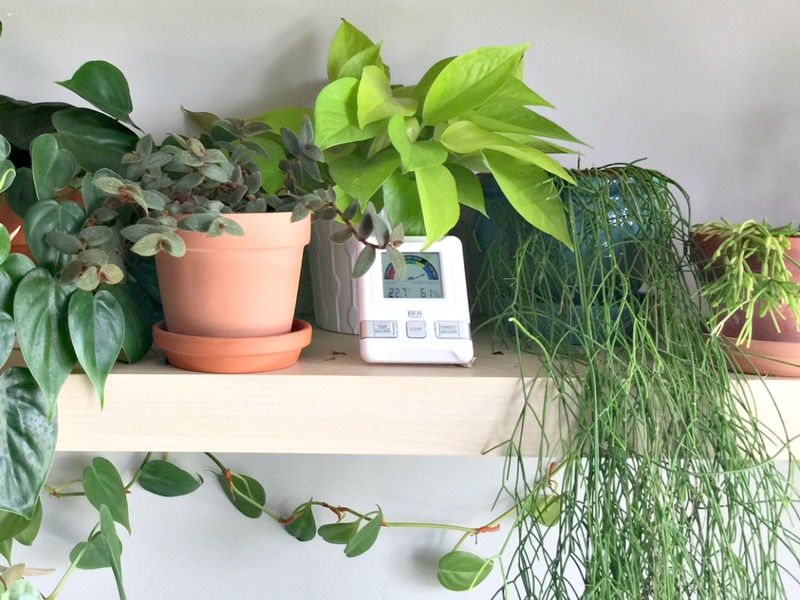 Teddy bear vine, nestled in with other plants. I would love to see your teddy bear vine if you have any. Upload a picture of it here or tag me on facebook or instagram @greenobsessions. That’s all for now. Reader’s Digest Association (1979). 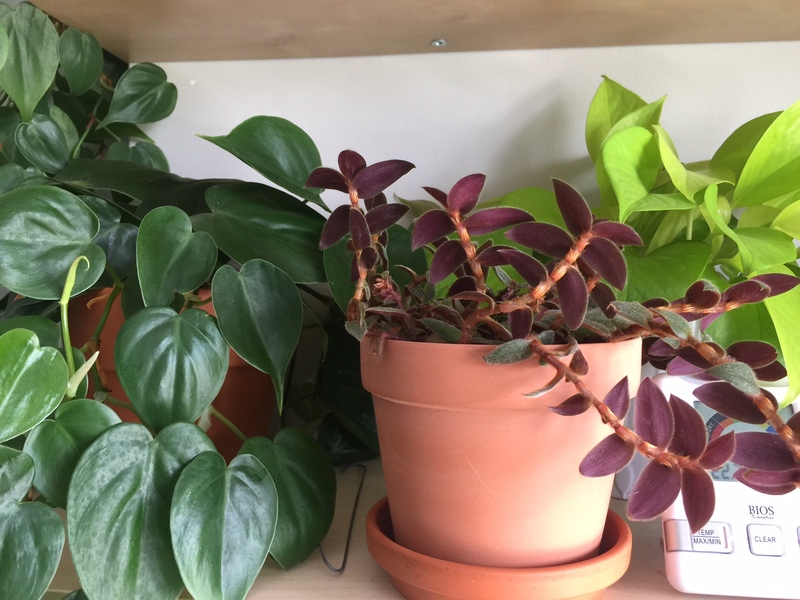 Success with house plants. 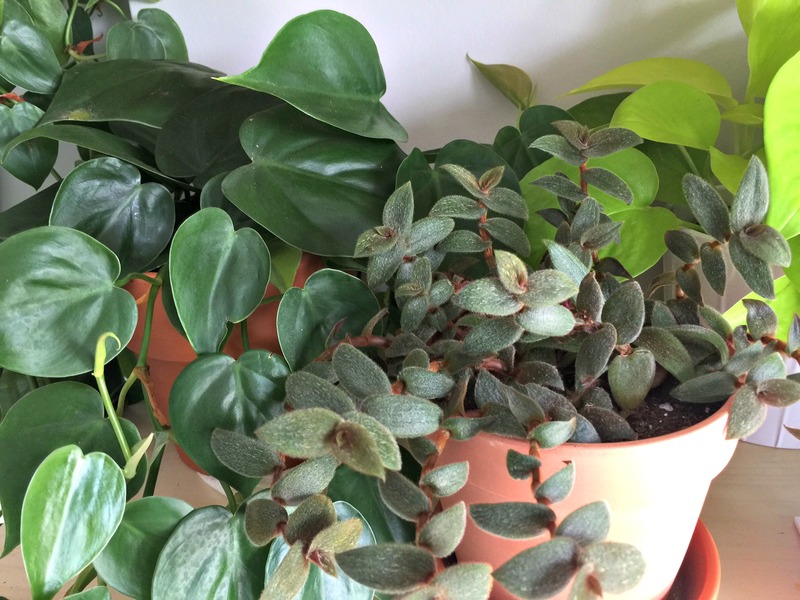 Hi, I’m Barbara and I’m a little obsessed with house plants. 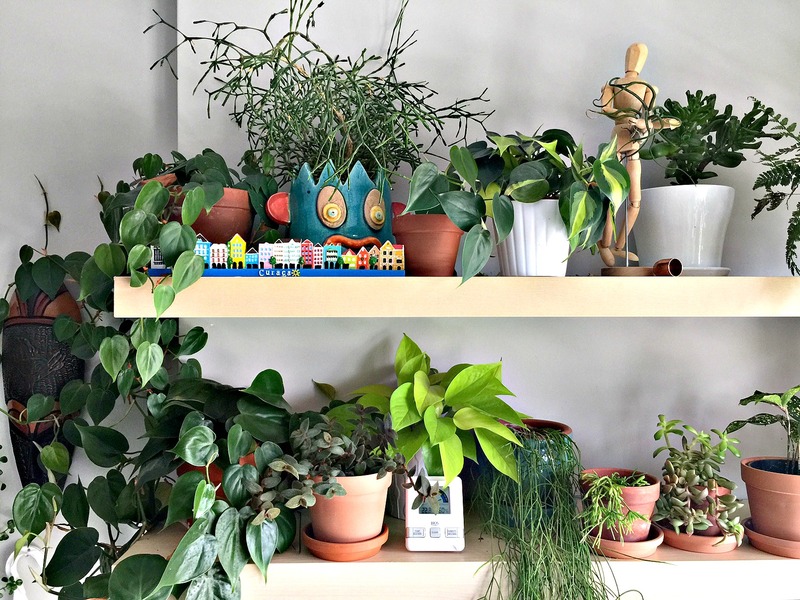 I share my house plant adventures in the hopes of inspiring you to continue to enjoy the greens in your home. And if you have no plants (yet!) 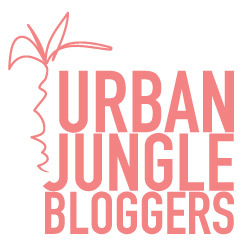 I hope this blog inspires you to add some green to your home. So go on! Try it! I think you might quite like it. And who knows? You may end up being … obsessed too. Is this plant way fragile or is it just mine. Many of vines that flopped over side of hanging pot are dying. They look like they were squashed against pot but they werent. I think mine needs some clean up inside but its like she’s got Fragile X and Im afraid to touch her. I have one of these! Love this plant! I purchased it at a Wal Mart garden center in Minnesota. I had to transplant it, but just a few days after I did, he perked up. I’ve had it for about 2 months now. I water him moderately about 2 times a week. He lives outside in partial sun and is misted once weekly to prevent pests. He has about 2 inches of new growth. 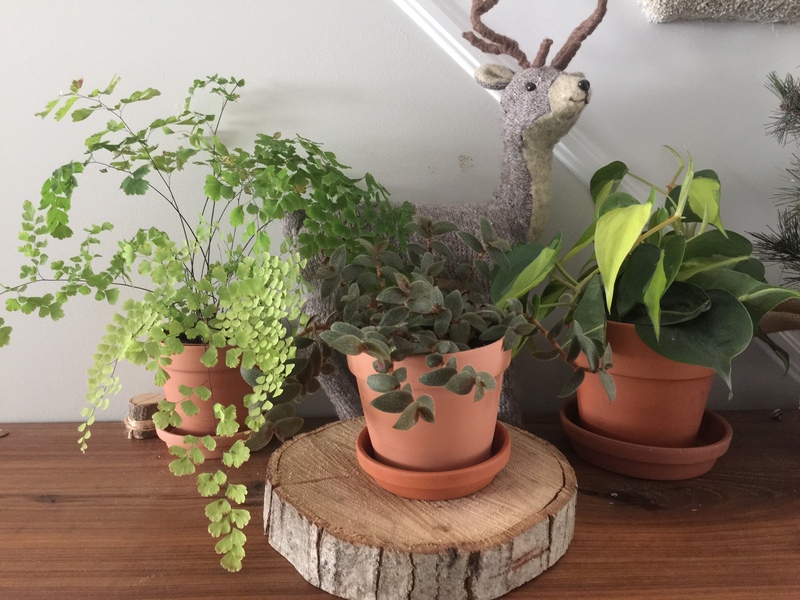 I am also a little obsessed with house plants. Bought one on clearance partly because I felt sorry for it and wanted to see if i could nurse it back to a good looking plant. i’ve Only had it a week and right now looks like a mutant tarantula, but it already has new growth. I think getting it out of the store to better lighting, humidity and proper watering will be the ticket to it becoming a cute fuzzy “teddy Bear” again! I saw this plant in a hanging basket at WalMart, of all places! I didn’t buy it, but I kept thinking about it. Went back, it was gone . Today I was in a different WalMart and there it was! Of course I had to have it. Those fuzzy little dense leaves are soooo adorable. It’s a plant that looks like you could hug it! Now I’m on the internet searching how to best care for it. This rather thick, there is a lot of plant in there and is quite heavy. They have really soaked it. Since this plant doesn’t live very long I (2-3 years) I’m wondering if it should be re-potted or left in this pot from the store? 2/24/18- just saw this plant at Walmart in Pennsylvania, some of the vines were broken off – a little abused from the store, so I picked 3 pieces up & brought them home and put them in some medium – time will tell. Crossing my fingers in hopes they will take. The fuzziness reminds me of the African Violet plant. Just a question, like the African Violet plant if you get water on them will they brown? And how long after you planted them did you see them grow? Thank you for taking your time and sharing your knowledge. Wish me luck! The teddy bear vines leaves should be nice and plump. If it feels flat then by all means water. However if it turns a dry papery brown, it’s a wrap. Remove the dead leaves and focus on bringing the others back to a healthy start. When I purchased this plant, it looked horrible, but with a little TLC, this plant has grown to be so beautiful. I’m so glad I purchased it! This is a lovely plant.